Tikkurila’s Finngard Clean product family, which has received the Finnish Key Flag symbol, is the answer to challenges posed by climate change to aggregate-coated facades. Due to the superhydrophobic surface, Finngard Clean products repel water and dirt, but allow any structural humidity to evaporate through it. The facade renovation of a housing company in Finland chose Finngard Clean because it repels water and dirt. Climate change has changed the weather conditions, with the winters being milder and more humid. Facades are under increasing stress, and surfaces remain wet for longer periods. This is a favorable growth medium for microbes and fungi, causing exterior surfaces to suffer damage more quickly. Tikkurila’s functional Finngard Clean is the only Finnish-made facade treatment solution that keep the surface clean. “Demand for Finngard Clean facade paints and surface coatings is increasing, because they meet future climate challenges excellently. 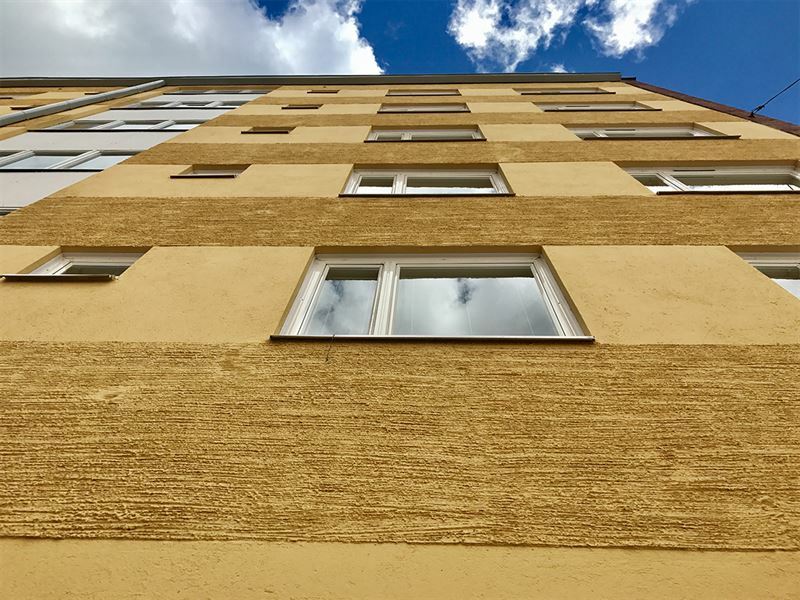 Thanks to surface treatment with our products, not only water but also dirt is washed off the facade surface, making it more difficult for microbes to grow on it,” says Tikkurila’s project sales manager Mikko Auer. Finngard Clean products are used, for example, for building facades, balconies and insulation and ventilated rendering targets. Surface treatment is possible by means of various techniques, and the products can be tinted. The color pigments of Finngard Clean products’ tinting colorants are inorganic, also improving their color and weather resistance. Thanks to the technical properties, the facade remains clear throughout the entire life cycle of the surface treatment. The surface treatment renovation of housing company Asunto Oy Hanko in Ratakatu 18–22, built in 1965, was carried out with Finngard Clean 1,5 facade coating. “We decided to use Tikkurila’s Finngard Clean 1,5 facade coating, because it repels water and dirt. The facade coating is also a good product to handle,” says Juha Ilvonen of Consti Julkisivut Oy, the contractor. The Ratakatu target is managed by OP-Filia Oy Ab, whose technical building manager Martin Kurman is pleased with the result. “The building is located on a street with trees nearby, so the dirt-repellent property of the facade will be put to a test. The facade renovation is almost finished, and it’s looking good,” says Kurman. The Finngard Clean product family consists of Finngard Clean facade paint, Finngard Clean 1,5 facade coating (grain size 1.5 mm) and Finngard Clean 3,0 facade coating (grain size 3.0 mm).